According to Kenya's Ministry of Health, 1.4 million people are infested with jiggers, a debilitating foot parasite. Around 80% of those affected are school-aged children. 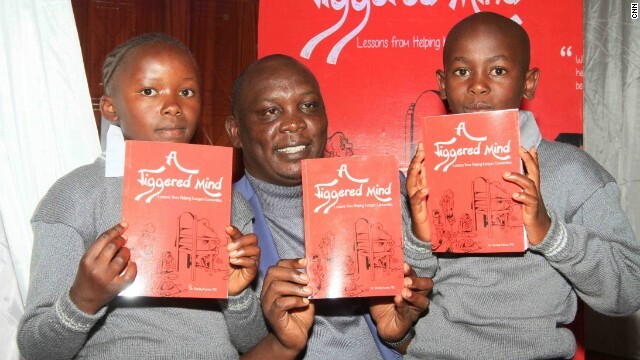 Kenyan businessman Stanley Kamau suffered from jiggers as a child. The condition almost made him drop out of primary school. 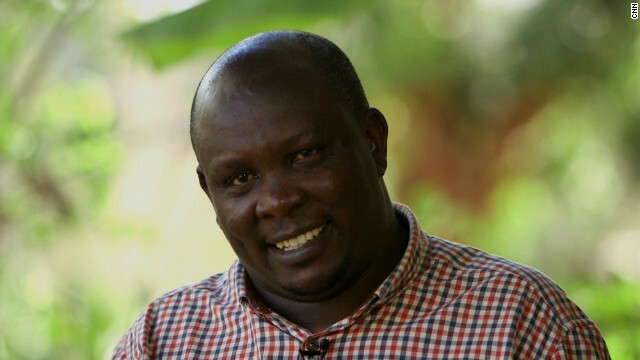 Kamau formed the Ahadi Kenya Trust, which provides medical treatment for 2.6 million Kenyans affected with jiggers. In addition to providing medical treatment, Ahadi provides shoes and fumigates homes to help curb the spread of jiggers. The Ahadi Kenya Trust now operates out of Tanzania and Uganda as well as Kenya. Kamau saw how jiggers entrenches families deeper into poverty. As a solution, he set up a banana farm on a stretch of land donated by his aunt. Jigger survivors can join the farm, and are given free materials to enrich their land back home. In his attempt to eradicate jiggers from his home country, Kamau realized how difficult it can be for many living in rural communities to seek medical attention. 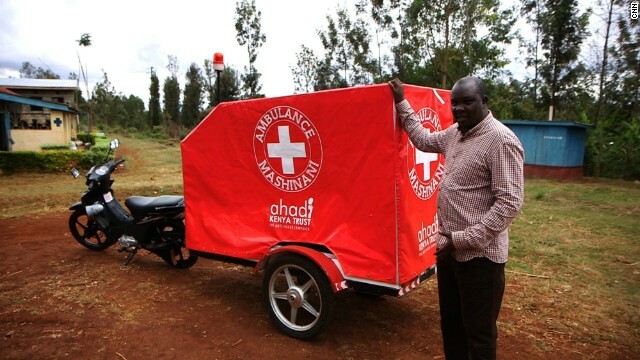 He developed the ambulance Mashinani -- or village ambulance -- that attaches to the back of a motorcycle. (CNN) -- One of the most debilitating medical conditions in sub-Saharan Africa isn't fatal. In fact, it's easily curable. The culprit is small, but its impact is big. The chigoe flea, more commonly known as a jigger, typically burrows itself into the feet and hands. It prevents millions of children from attending school, stops farmers from working their land, and makes walking all but unbearable. 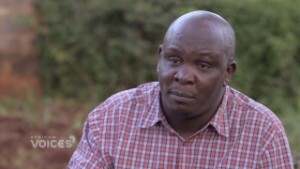 Kenyan businessman Stanley Kamau had jiggers as a kid, and he remembers how he was stigmatized by his classmates, for in his school, the parasite singled you out as poor. "I almost dropped out of primary school because of the effects, because I could not stand the way my classmates laughed at me and used to harass me. They would step on me, and I didn't have shoes," he recalls. Luckily, Kamau's family owned cattle, and had a cattle dip -- a bath filled with insecticide -- which they used to treat the cows. Kamau cured himself by dipping his hands and feet in the water. He was able to continue his studies, and went on to attend university in India. After successfully launching a number of businesses, Kamau returned to his home village in Murang'a, where he decided to give back to his community. At first, he simply donated food and clothes, but soon he realized the adverse effect jiggers was having on his fellow villagers. "I was shocked when I visited some of the homes and saw that some kids had never gone to school, that men and women weren't going to their farms. They were disabled because of the jigger menace." Kamau set up the Ahadi Kenya Trust, which treats victims of jiggers throughout Kenya. Originally, the trust signed up four families. Today, 2.6 million Kenyans are registered with the group. Kamau saw how jiggers entrenches families deeper into poverty. 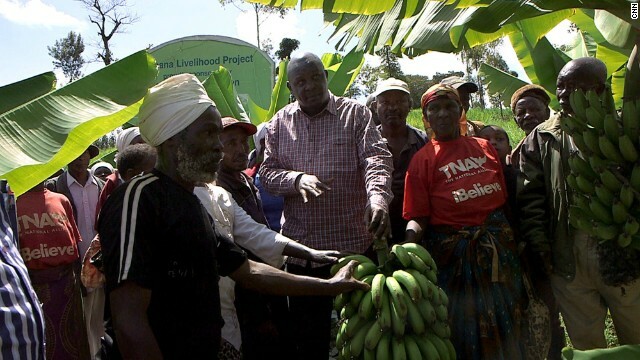 As a solution, he set up a banana farm on a stretch of land donated by his aunt. Jigger survivors can join the farm, and are given free materials, from seeds to fertilizer, to enrich their land back home. "Every member has to duplicate what we are doing on their own particular farm," he says. "We provide them with seedlings to plant in the communal farm, and give them seedlings to plant in their own individual farm... it's like a learning center where every member of the community can learn more on how to do bananas." Kamau has expanded the entrepreneurial side of his trust to include chicken and rabbit farming, as well as bee keeping. In his attempt to eradicate jiggers from his home country, Kamau realized how difficult it can be for many living in rural communities to seek medical attention. He heard stories of people brought to hospitals in sacks and wheelbarrows. He even heard about a boy who broke his back in a motorcycle accident while he was being transported to a medical facility for a fractured arm. "The fact is, most people who live at the bottom of poverty don't have mobile phones, they don't have radios or TV sets, they have no channel of communication. They might not even know what kind of a dispensary or hospital is near them," he notes. 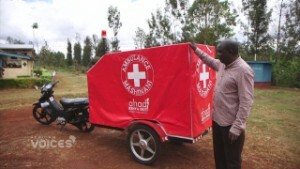 It was then that he developed the ambulance Mashinani -- or village ambulance. It's basically a detachable bed -- complete with a medical and maternity kit -- that hooks onto a motorbike. "You can have a hospital, but are people able to visit? Are they able to walk? Are they able to call? Are they able to even have information on those types of facilities? Let's not have a very beautiful hospital where people are not able to get access." Read: Are these Africa's funniest comics?